Is your current smartphone not so smart anymore? Did you know you can donate it? Got gift cards sitting in a drawer unused? Did you know you can donate those too? See how simple it is to give. Get iDonate for your church. The secular world offers little to no hope for substance abuse addicts. Are they doomed to be slaves to their habits for life? Do they have a disease they cannot conquer? Are their lives an endless cycle of recovery? Christ—in His amazing power, love, and grace—offers forgiveness and full freedom from sin’s grip. 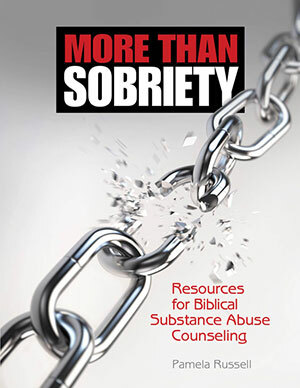 Regular Baptist Press offers More than Sobriety, aready tool that puts the Biblical perspective on addiction and substance abuse. It gives Biblical answers in an easy-to-use format to employ when sitting across from someone who has a substance abuse problem, whether in the church office, the county jail, the local homeless shelter, or the coffee shop. You will find that each lesson has a section for the counselor/teacher and a handout for the counselee. A helpful initial assessment form is included. Order your copy today. Read author Pam Russell’s ministry profile. Posted in Classifieds, e-INFO, November 2014 on November 3, 2014.